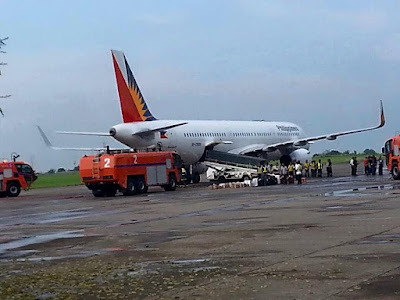 Aviation Updates Philippines - Philippine Airlines Flight 1814, a scheduled daily flight from Davao to Manila made an emergency landing at the Francisco Bangoy International Airport due to a reported smoke by the aircraft's system at the cargo compartment area. The flight which is operated by an Airbus A321-231 aircraft departed Davao with 131 passengers and 6 crew at 1:07 PM, after a one hour and 27-minute delay. On its way to Manila, the European-made aircraft detected smoke on its cargo bay. Both pilots then contacted Mactan Center and were instructed to return to Davao Airport. The aircraft landed safely at 1:33 PM, around 26 minutes after the aircraft departed for Manila. The plane was parked at the airport's old terminal after landing. The passengers were disembarked and the cargoes were offloaded from the aircraft at the old terminal. 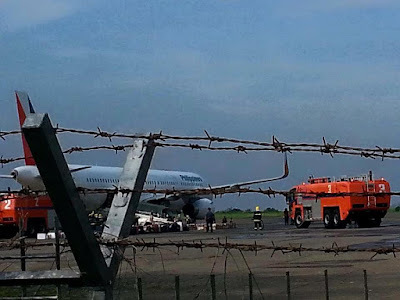 During the process, Davao City's elite Central 911 and the airport fire and crash rescue personnel responded to prevent the spreading of fire. According to Philippine Airlines Spokesperson Cielo Villaluna, "the aircraft is now parked at the old terminal for technical evaluation, assessment and investigation." The affected passengers, including Dr. Elenita Binay, the wife of Vice President Jejomar Binay; Las Piñas Representative Mark Villar, son of Senator Cynthia Villar; and Sultan Kudarat 1st District Representative Pax Mangudadatu, was accommodated with the next available flight. A few weeks ago, the Davao International Airport together with the Civil Aviation Authority of the Philippines conducted an emergency landing drill at the airport from 12:00 NN to 3:00 PM in order for the personnel and passengers to know what to do in case of emergencies.